L-R: Managing Director, The Shell Petroleum Development Company of Nigeria Limited (SPDC) and Country Chair, Shell Companies in Nigeria, Mr. Osagie Okunbor; Shell’s External Relations Manager, Mr. Evans Krukrubo; Minister of State for Petroleum Resources, Dr. Ibe Kachikwu; Senior Technical Adviser to Minister on Refinery, Downstream and Infrastructure, Mr. Rabiu Suleiman; and the Executive Secretary, Nigerian Content Development and Monitoring Board, Mr. Simbi Wabote, at the 2nd edition of the Nigerian Oil and Gas Opportunity Fair in Yenagoa, Bayelsa State… last week. 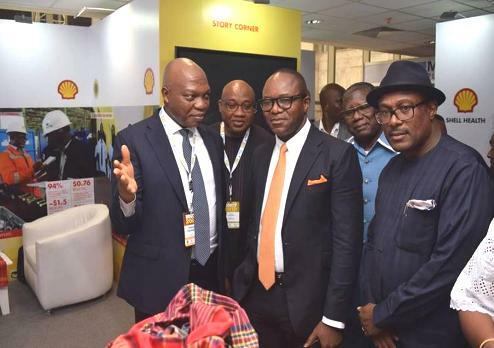 LAGOS APRIL 7TH (NEWSRANGERS)-Shell Companies in Nigeria have emerged the International Oil Company with the most impactful Local Content Initiatives in the upstream category at the 2019 edition of the Nigerian Oil and Gas Opportunity Fair (NOGOF) held in Yenagoa, Bayelsa State on April 4, 2019. Shell beat other competitors ,Total and Exxon Mobil to the second and third positions respectively at the 2nd edition of the fair organised by the Nigerian Content Development and Monitoring Board (NCDMB). The Executive Secretary of NCDMB, Mr. Simbi Wabote, who presented the award, singled out Shell Companies in Nigeria for exemplary support to local vendors and suppliers in the oil and gas industry, which, he said, enabled greater participation of Nigerians in the service value chain. Receiving the award, Managing Director of The Shell Petroleum Development Company of Nigeria Limited (SPDC) and Country Chair, Shell Companies in Nigeria, Mr. Osagie Okunbor, described the recognition as an important acknowledgement for the impressive work Shell companies continue to do in Nigeria content development. The NOGOF award is a confirmation of the leadership position of Shell in local capacity development in the oil and gas industry. In 2018, Shell Companies were named the Local Content Operator of the Year at the Annual Oil Industry Achievement Awards Dinner of the Petroleum Technology Association of Nigeria (PETAN,) an association of indigenous technical oilfield service companies in the upstream and downstream sectors. PETAN had also honoured SPDC with the Distinguished Achievement Award (Corporate) in 2016 while the Managing Director of Shell Nigeria Exploration and Production Company (SNEPCo), Bayo Ojulari, received PETAN’s Professional Award in the same year for his notable contributions to the development of Nigerian content in the oil and gas industry. In addition to awards from PETAN, Shell Companies in Nigeria have also been honoured in Nigerian content development by the Nigeria Oil and Gas (NOG) Conference, the Nigerian Association of Petroleum Explorationists (NAPE), the Nigerian Chamber of Shipping and at the Social Enterprise Report and Awards (SERAs).